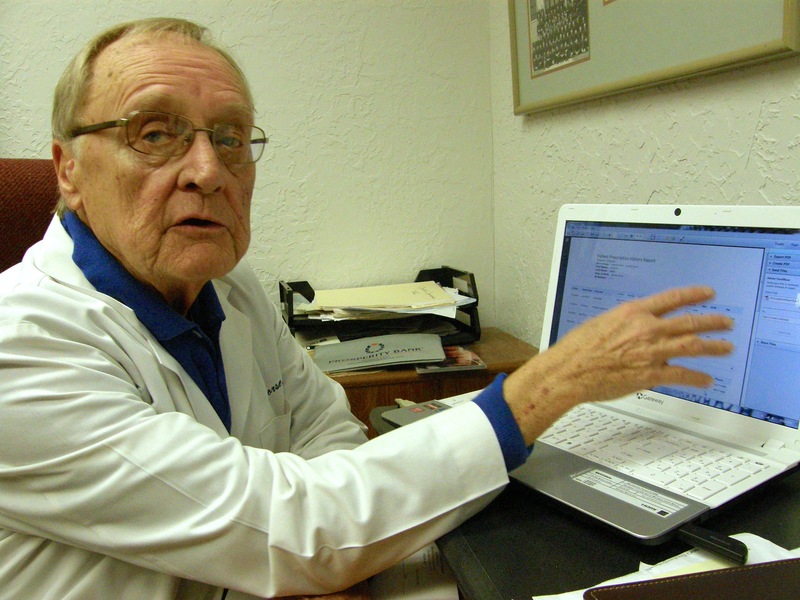 Hal Vorse, an Oklahoma City physician who specializes in drug addiction, checks a reporter’s prescribing history on the state’s Prescription Monitoring Program. The check took about 90 seconds to complete. The latest statistics suggest that 5 percent of Oklahomans over the age of 11 will abuse prescription painkillers this year. Several hundred of them will wind up dying of accidental overdoses. A few lucky ones will wind up in Hal Vorse’s addiction clinic. Vorse, a former pediatrician, has dedicated the second half of his medical career to helping people wean themselves off highly addictive opiate painkillers like hydrocodone and oxycodone so they can go back to leading productive lives. Vorse, 71, also serves as medical director of several residential treatment centers for drug and alcohol abusers in central Oklahoma, and presents addiction medicine seminars for students at the University of Oklahoma Health Sciences Center. In two recent interviews, Vorse urged state officials and medical professionals to take more aggressive action to deal with the growing problem of prescription drug abuse. The interviews have been edited and condensed. Q: What do the statistics tell us about prescription drug abuse? A: It has become one of the leading causes of death in people between 18 and 55. More people are dying from overdose deaths in Oklahoma than are being killed in motor vehicle accidents. The most recent data, from 2012, is over 800 overdose deaths in the state. About 80 percent of those are due to prescription drugs. Q: As public health crises go, how big of a problem is this? A: This is one of the major public health issues of our time. Q: With all of the attention this issue has gotten, why does the death toll keep rising? A: I’m not sure the message has gotten out to all the doctors. I don’t know if they haven’t gotten the message or they don’t believe the message. But it’s amazing to me how many of them insist on writing for hydrocodone and oxycodone. Q: Who are the victims? A: It’s mostly people who are addicted. People who are predisposed to becoming addicted have access to the drugs through legitimate prescriptions. They will obtain these drugs initially legally, but eventually they will get multiple prescriptions from other doctors or they will start buying the drugs on the street. Q: Doesn’t this often start with people who have legitimate pain issues? A: Absolutely. I would say half of our new patients that have opiate addiction got legitimate prescriptions for legitimate reasons. But they discovered that they really liked the euphoria produced by the drugs and started using more and more, and eventually started taking so much that it interfered with their ability to function. The cost of these drugs gets very expensive, so many of these people resort to committing crimes in order to get the drugs they need. The burden on society is not just the direct effects of the addiction, but also the crime (and) the utilization of the health care system. The cost to society is just huge. Q: Have you ever had a patient die from an overdose? My background is pediatrics. I didn’t write a lot of prescriptions in that area for controlled substances. Since I’ve been working in the addiction field, I now use controlled substances to treat addiction. I really didn’t learn about addiction until it affected me personally in my 40s. That’s when I really learned about the nature of it. Q: Are you willing to share your own experience? A: I’m a recovering alcoholic. I’ve been in recovery for 28 years. That’s how I got interested in working in the field. After I retired from pediatric practice, I had an opportunity to start working in this field. I’ve been blessed to have a second career. It was my own recovery that got me interested in the first place. Those of us who have this disease, our brains are wired differently than other people, and our perception of pleasure and pain is different. Our reaction to narcotics is really abnormal. The obsession to use is so powerful. I’ve seen women give up their children rather than get clean. I’ve seen people choose going to prison rather than getting into recovery because their desire for drugs is so high. The miracle is some of us are able to stay clean. It requires daily work at recovery. Q: Why aren’t physicians more cautious about prescribing these drugs? A: When a patient comes to you and they’re complaining, the doctor’s natural response is, let’s fix it. And the way health care is financed today, if a primary-care physician sees less than 30 patients a day, he’s not going to make any money. He has no incentive to take the time to talk to these people about these things. It’s easier to write this script and send them on their way. In the ‘90s, there was a big push to treat pain more aggressively. In an effort to be humane about providing pain relief, I think some of us have gotten over-aggressive in treatment and have prescribed larger quantities of narcotics than the patients really need at times. A lot of physicians don’t appreciate how severe a problem it is to mix different kinds of controlled substances, particularly opiates with benzodiazepines. Fifty-five percent of the people who die of overdoses in this state are using two or more controlled substances at the same time, or using those drugs in combination with alcohol. That is a very lethal combination. Q: Do Oklahoma doctors fully appreciate the potential for addiction and overdoses? A: I really don’t think so. We don’t really teach doctors much about addiction in medical school and in their graduate and post-graduate training. So a lot of doctors aren’t trained on how to recognize someone who is becoming addicted or the early stages of addiction. By the time they realize that this patient is abusing the drugs they’re prescribing, their addiction disease has gotten pretty severe. Q: Are state agencies doing enough to police over-prescribers? A: I think they’re trying hard to do the best they can with what they have to work with. The problem is that the agencies don’t communicate very well. The Office of the State Medical Examiner, the Oklahoma Bureau of Narcotics, the Oklahoma licensing boards should all be working together on this problem. Another problem is because of underfunding. The Office of the Medical Examiner is about two years behind in reporting overdose deaths and their causes. So oftentimes when people die of an overdose, we don’t find out the details of that for a year or two after it happens. Right now, the most recent data we have on overdose deaths in Oklahoma are from 2012. We don’t have any data yet from 2013. That’s a statistic that we should be monitoring just as carefully as we monitor tuberculosis and hepatitis and other infectious diseases. Doctors get data every month about the incidence of these diseases. But we don’t get any information about overdose deaths. Q: When an overdose death occurs, what ought to happen? A: A priority should be given on finding out what caused that overdose. Then that data should be shared. We ought to be monitoring those deaths … and track where these people are getting their drugs … and finding out where we need to intervene. The people who are involved in taking care of these patients need to be notified that their patients have died. That will help educate them as to the risk involved in prescribing these drugs. Q: Is the Prescription Monitoring Program working effectively? A: We probably have the best PMP in the country right now. Pharmacists have five minutes from the time they fill a prescription to report it to the PMP. So physicians have access to real-time information on prescriptions being filled for controlled substances. The problem is, not all the doctors are using it. If doctors would use it on every patient that’s getting a prescription for a controlled substance … I think they would find this to be very instructive. Once the doctor understands how to use the system, it’s very efficient and doesn’t take any time at all. Q: Hasn’t the medical lobby opposed making PMP checks mandatory? A: A lot of people in the medical community have fought that. Their fear is, it’s going to take too much time and effort. However, the Oklahoma Bureau of Narcotics has streamlined the process to where it costs very little in time and money to monitor these. We run a PMP report on every patient on every visit because of the nature of our practice. We can get that run in less than a minute. Q: Should the narcotics bureau share its reports on top prescribers with the medical licensing boards? A: Yes, they should be doing that … All of these different agencies should be sharing this data on a timely basis, and I mean daily, or weekly, even. A: Number one, access to good treatment for addicts early on in their disease. We know how to treat addiction. The problem is getting access to treatment for people who need it. We have this big surge of opiate addiction, and yet we have decreased access to care for the people who need it the most. It’s just heartbreaking to see. Every week I see people who really need long-term inpatient treatment, and there’s just no place to put them. You send them to outpatient counseling knowing full well that they’ll relapse within six months. Q: Who needs to take the lead? A: It’s got to start in the Legislature and the governor’s office. The medical community needs to step up and demand that this be treated as a public health problem. The general public needs to be educated. The various agencies … need to be working together and develop programs to address this as a public health problem and not a criminal justice problem. We’ve taken the attitude that the way to address the addiction problem is to be tough on crime and to punish these people. The fact is, these are sick people who need to get well, not bad people who need to get good. The crimes committed by the people who are afflicted with this disease are the result of the disease, not the cause. Advice and places to call, go or link to regarding prescription narcotics.